Great white sharks fitted with cameras on their dorsal fins have been filmed for the first time stalking prey in dense kelp forests long thought to be no-go zones for the top-level predators. The thrilling, shark's-eye views show the massive carnivores manoeuvering effortlessly thought thick kelp fronds suspended in the water like giant bean stalks. Suddenly one shark—off the coast of South Africa—spots several Cape fur seals, and the chase is on. 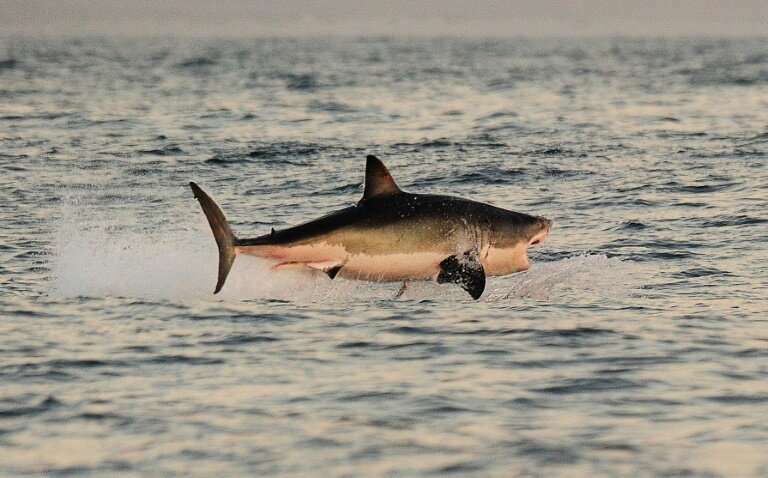 "The shark drastically increased its activity when it saw the seals, and all sharks raised activity in the presence of kelp," Oliver Jewell, a graduate student at Murdoch University in Western Australia and lead author of a study in Biology Letters, told AFP. Great whites—which can grow up to six metres (20 feet) long and weigh more than 2,500 kilos (5,500 pounds)—gather along the coast of South Africa in winter to feed on seals that congregate on rock formations at the water's edge. To execute an "open-water ambush," previous research has shown, the sharks close in on colonies at dawn or dusk, swimming in deep waters below their unsuspecting prey. Invisible to the seals in the dim light, the sharks scan from below for a silhouette. Zeroing in on a victim, a great white "charges up to grab the seal at the surface and breaches clear of the water," Jewell said. Near Dyer island, where Jewell and his colleagues conducted their field research in 2014, this kind of attack appears to occur less frequently. One reason, they speculated, may be the region's thick kelp forests, long thought to be a natural barrier to sharks and a refuge for seals avoiding their razor-sharp teeth. To find out if that was true, Jewell and his team fitted eight great whites with high-resolution motion sensor tags—the equivalent of underwater Fitbits—with in-built cameras. "We attract the sharks using a line baited with a tuna head or a seal-shaped decoy, and then—when a shark closes in for a look—we use a pole to clamp the tag to the dorsal fin," Jewell explained. 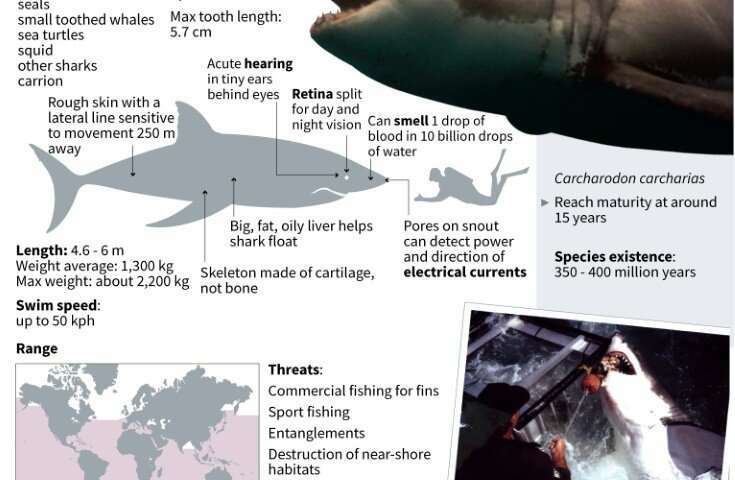 Factfile on the great white shark. "At times, we would have to spend many hours at sea, perched over the side of a boat to deploy these tags," added Taylor Chapple, a professor at Stanford University and team leader. The shark-cams were designed to detach after a couple of days, and rise to the surface where they were picked up. The researchers were amazed by the footage. Not only did the wide-bodied sharks venture into the kelp beds, they clearly were on the hunt when they did. On average, the predators spent about 20 percent of their time in the seaweed forests adjacent to a colony with some 50,000 to 60,000 Cape fur seals. More than 28 hours of video data did not record a kill, but it did show one shark closing in on a group of seals darting through the kelp to avoid getting eaten. The sharks showed no hesitation or reduced mobility while gliding through the underwater jungle. "They are able to make some pretty spectacular 180 degree turns," Jewell said. While the object of unrelenting fascination, very little is known about the behaviour of great whites. "We are really only scratching the surface with this study," said co-author Salvador Jorgensen, a senior research scientist at the Monterey Bay Aquarium in central California. "In the future, we hope these cameras will be used to study the sharks' mysterious behaviour in the open ocean where they dive repeatedly to great depths." As it turns out, great whites and many other shark species—which have lorded over oceans for 400 million years—are in far greater danger of extinction than their prey. Cape fur seals are listed in the category of "least concern" on the Red List of Threatened Species, while great white sharks are seen as "vulnerable" to extinction.